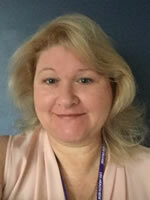 Dr. Linda Manfrin Ledet is an Assistant Professor at Louisiana State University Health Sciences Center School of Nursing. She received a Bachelor of Nursing Science and a Master of Nursing from the Louisiana State University Medical Center, and Doctorate of Nursing Science from Louisiana State University Health Science Center. She has been in nursing education for over 19 years. Dr. Ledet is certified as an Advanced Practice Registered Nurse - Clinical Nurse Specialist by the Louisiana State Board of Nursing. She is board certified in Adult Psychiatric and Mental Health Nursing by the American Nurses Credentialing Center. Dr. Ledet is a member at large in the state of Louisiana in the American Psychiatric Nursing Association and past president of Sigma Theta Tau International Honor Society of Nursing, Xi Zeta Chapter. Dr. Ledet has received several honors throughout her career including being the recipient of the Sigma Theta Tau Xi Zeta Teaching Excellence Award and the Research Award, and the LSUHSC School of Nursing Caring Award and the PK Sheerly Nursing Entrepreneur Award. Clinical experience and expertise includes mental health nursing, intimate partner violence prevention, HIV infection risk behaviors, and professional boundaries. Dr. Ledet has served as an expert witness on professional boundaries for the Louisiana State Board of Nursing. Manfrin-Ledet, L., Porche, D., and Eymard, A. (2015). A challenge of providing nursing care in home settings: Professional boundary violations literature review, Home Healthcare Now, 33(6), 326-332. Manfrin-Ledet, L., Porche, D., and Westbrook, S. (2015). Relationship of intimate partner violence , human immunodeficiency virus risk behaviors, and powerlessness in African American women of child bearing age. Journal of the National Black Nurses Association, 26(1), 40-49. Manfrin-Ledet, L. (2013). Acknowledgements as contributor for Chapter 9: Schizophrenia and other psychotic disorders. In M.A. Hogan (Ed. ), Mental Health Nursing: Reviews & Rationales (3rd ed.). Upper Saddle River, NJ: Prentice Hall. Manfrin-Ledet, L., Porche, D. & Willis, D. (2012). Violence Research. In J. Fawcett & M. Wallace (Eds. ), The Encyclopedia of Nursing Research (3nd ed.). New York, Springer Publishing Co.
Manfrin-Ledet, L. (2011, December). Literature Review on Professional Boundaries. At Louisiana State Board of Nursing Disciplinary Hearing. Manfrin-Ledet, L. and Bennett, M. (2010). Psychiatric issues: Case studies and quiz. In B Swanson (Ed. ), ANAC's Core Curriculum for HIV/AIDS Nursing, (3nd ed.). Jones and Barlett Publishers. Manfrin-Ledet, L. (2008). Chapter 9: Schizophrenia and other psychotic disorders. In M.A. Hogan & G.B. Smith (Eds. ), Mental Health Nursing: Reviews & Rationales (pp. 176-193). Upper Saddle River, NJ: Prentice Hall. Manfrin-Ledet, L., Porche, D. & Willis, D. (2006). Violence Research. In J. Fawcett & M. Wallace (Eds. ), The Encyclopedia of Nursing Research (2nd ed.). New York, Springer Publishing Co.
Manfrin-Ledet, L. (2003). Chapter 9: Schizophrenia and other psychotic disorders. In M.A. Hogan & G.B. Smith (Eds. ), Mental Health Nursing: Reviews & Rationales (pp. 171-187). Upper Saddle River, NJ: Prentice Hall. Manfrin-Ledet, L., Mitchell, D., & Bennett, M. (2006) Spiritual development of nursing students: One approach to preparing nursing students competent to provide spiritual care at the end of life, Journal of Nursing Education, 45(9), 365-370. Manfrin-Ledet, L., & Porche, D. (2003). The state of science: Violence and HIV infection in women. Journal of the Association of Nurses in AIDS Care, 14(6), 56-68.